Many teachers can think back to their early days of teacher education and recall several of the things that were drilled into their heads - among them Bloom’s Taxonomy of educational objectives. At this point in their careers, perhaps more abstraction than reality, Bloom’s became not much more than a label, with the idea that a “good” lesson “should” involve students in higher-order thinking skills. Moreover, those skills became a sort of de facto checklist. The higher-order thinking skill itself was the goal, many times with little thought as to why it was being included, what relationship it would have to the curriculum, or how students would achieve the necessary skills. 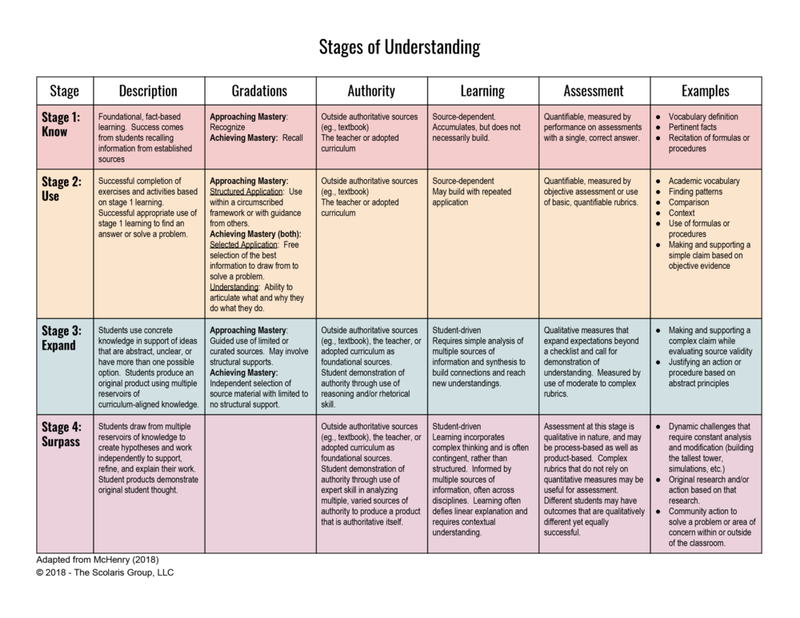 Stages of Understanding, much like other educational taxonomies, is designed to be a scaffold with a progression from student dependence on others as a source of knowledge to their ability to use what they have learned to produce their own knowledge and understandings. You will see echoes of techniques that are among those that are the tried and true of education. Indeed, this conceptual scaffold does not seek to reinvent the wheel, only to equip it with a higher-performance tire. 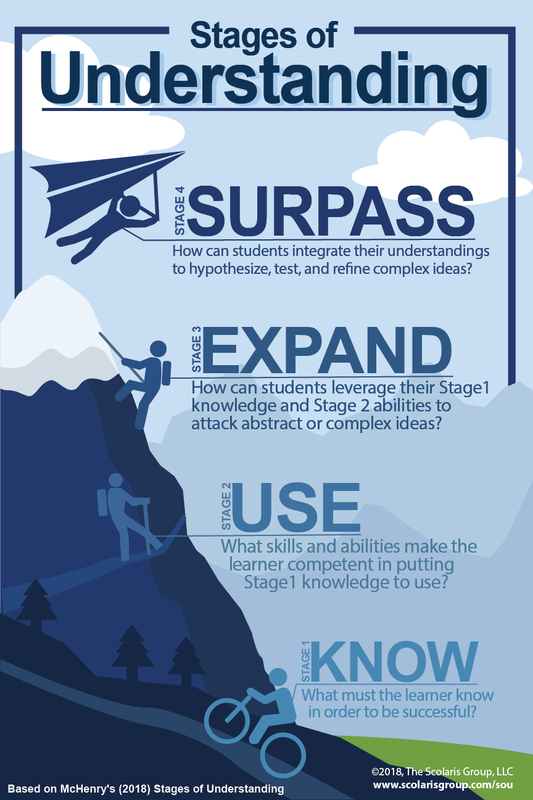 This model involves four stages of student understanding: Know, Use, Expand, and Surpass. Of these, know and use occupy a lower tier called Curriculum Driven Learning (CDL). Having mastered CDL, students can begin to expand what they have learned and potentially surpass the curriculum in ways that might not have been imagined by the teacher. This tier is called Student Driven Learning (SDL). The student who has mastered a subject should be able to achieve Stage 3: Expand. Students who reach Stage 4: Surpass generally are contributing new knowledge to a field. What must the learner know in order to be successful? For a printable PDF copy of this chart, click here. Students demonstrate knowledge of the curriculum by being able to recognize (approaching) or recall (achieving) facts. Examples include: vocabulary definitions, pertinent facts (eg., atomic weight of an element, genus and species of an animal, name of an explorer), recitation of a math formula. Student work in the “know” category has one objectively correct answer that is drawn from an outside authority (the teacher, a textbook, etc.). Learning is source-dependent and accumulates, but does not necessarily build. Information in this stage is relatively static. Student progress in the know category may be quantitatively measured between and across student groups. Obtaining mastery of this stage is important to the student for its value on a test, as a step to the next stage of learning, and/or for understanding context. Steps to engagement: Make connections, build relevance. Why is this important in the bigger picture? Why is this important to students? Click here for more information on Stage 1: Know. What skills and abilities make the student competent in putting Stage 1 knowledge to use? 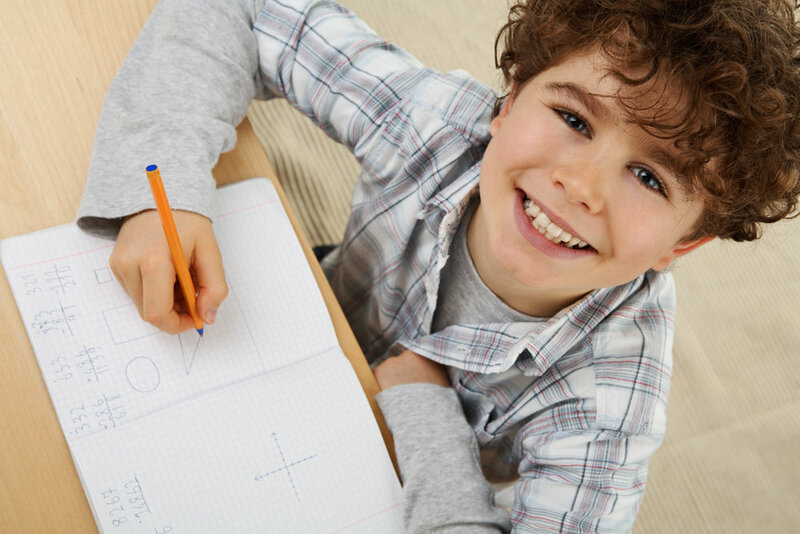 Students are able to use what they know in completing activities and exercises relating to their knowledge. Examples include: academic vocabulary, finding patterns, comparison, context, using formulas to find a solution, making and supporting a simple claim based on objective evidence. Like the know category, student work in this stage has one objectively correct answer, however students are required to understand and independently apply what they have learned to reach an answer. Learning is source-dependent and may build with repeated application. Student progress in this stage may often be quantitatively measured between and across student groups and may rely on basic qualitative measures that are readily quantifiable (such as basic rubrics). Obtaining this stage is important to the student to be able to make meaning of what s/he has learned through application of what is otherwise static knowledge. Steps to engagement: Connect to applications the student finds meaningful. Click here for more information on Stage 2: Use. How can students leverage their Stage 1 knowledge and Stage 2 abilities to attack abstract or complex ideas? Students are able to use concrete knowledge in support of ideas that are abstract, unclear, or have more than one possible option. Students draw from multiple reservoirs of curriculum-aligned knowledge and learning within or between subject areas to evaluate how or why something came to be. Examples include: making and supporting a complex claim based in an evaluation of the validity and usefulness of evidence and sources, In history, this would include understanding context and the perspectives of historical actors. Student learning in this stage is measured using more qualitative, rather than quantitative, measurement. Obtaining this stage is important to the student to be able to understand, rather than simply know, the curriculum. At this point, because students come to understand the why, they are able to expand their use of what they have learned beyond the formal curriculum and use their learning to aid in a search for meaning. Steps to engagement: Pose incremental questions/challenges to scaffold student thinking and discovery. Click here for more information on stage 3: Expand. How can students integrate their understandings to hypothesize, test, and refine complex ideas? Students draw from multiple reservoirs of knowledge to create hypotheses and work independently to support, refine, and explain their work. While curriculum-themed, student work in this area draws from multiple arenas, including those outside the curriculum and student original thought. Student learning in this category may be evaluated qualitatively, and evaluation may be independent of whether a particular goal or objective was achieved. Click here for more information on Stage 4: Surpass.